PC gaming has never been bigger than it is right this very second! Esports is huge right now, and as games get better and better they are becoming more and more competitive. This is great for everyone, but if you are new to PC gaming or even Esports you may not have the ability to spend $150+ on a keyboard. Logitech has got you covered with the brand new Prodigy G213 RGB Gaming Keyboard. Logitech is known for making some of the best PC and gaming accessories. Personally, my entire PC set-up right now is utilizing Logitech to it’s fullest capacity and I could not be pwning noobs nearly as hard as I am if it wasn’t for Logitech. Let’s find out if this is the right keyboard for you. Are you a new gamer, or looking for a more portable option for a full-size keyboard? If you answered yes to either of these then you are in luck, my friends. The Prodigy G213 keyboard will first off not break the bank. For less than 70 clams you can own this beauty. 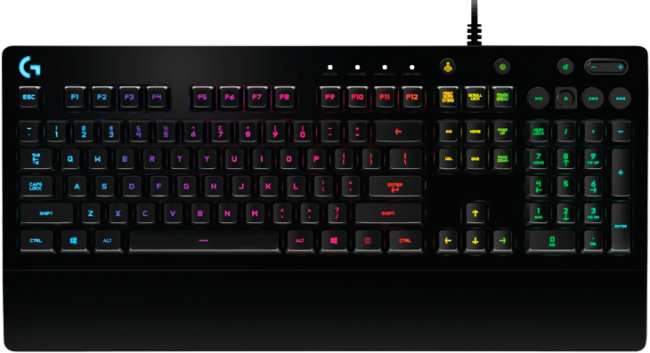 With Logitech’s gaming software, you can program this keyboard to work perfectly for you. Like pretty things? Who doesn’t?! With the gaming software, you can also program the RGB keys to light up with 16.8 million color options. This makes it possible to game late at night without having to bother turning the light on. You can also program the keyboard to act differently depending on the game you are playing. Each game can display a different color pattern if you’d like it to. A great feature of this keyboard is you aren’t going to be over encumbered with Macro keys. Sure, macro keys serve a purpose but if you are just getting into gaming they are 100% unnecessary. You can still program the F keys if you feel you do need more customization in your life with the gaming software. Logitech is also able to cut down the size tremendously because of this. This is great for portability if you’re in a dorm with a small desk or just need more room for beer. I mean soda. A great feature of this keyboard is you aren’t going to be over encumbered with Macro keys. Sure, macro keys serve a purpose but if you are just getting into gaming they are 100% unnecessary. You can still program the F keys if you feel you do need more customization in your life with the gaming software. Logitech is also able to cut down the size tremendously because of this. This is great for portability if you’re in a dorm with a small desk or just need more room for beer. I mean soda. Speaking of beer…or soda, the Logitech Prodigy G213 keyboard is spill resistant. I am the number one culprit of spilling my frothy beverages on my keyboard. Not on purpose, but it happens. You get caught up in the action, jump, spin, no scope someone and you get a little excited and things spill. It happens. You don’t need to fear destroying your keyboard though with the special membrane Logitech created to keep our tools safe. You’re a gamer, and your keyboard will get abused. Get a keyboard that can handle it! Not interested in an extremely loud keyboard that will disturb your dorm mate? Another plus for the Logitech Prodigy G213 gaming keyboard. Because it isn’t a mechanical keyboard, the sound of each key press is much quieter in contrast to a traditional mechanical keyboard. You do not need to worry about ghosting as this keyboard has a great anti-ghosting matrix. Press all the keys you want, as fast as you want and you will get the reaction in game that you wanted. These keys are incredibly responsive and up to 4 times faster than a standard keyboard with a full 4mm travel distance. In other words, it works a lot like a mechanical keyboard, once again great for those getting into gaming. My final thoughts on this keyboard are simple. It is a beautiful, well-thought keyboard that will work wonders for those entry level gamers. The entire Logitech Prodigy line is exclusively for everybody. This keyboard fits that moniker to a T. While it took a little getting used to as I am used to playing with a mechanical keyboard, at not time did I feel that my performance was being hindered. It was comfortable and supported my wrists nicely. It also feels durable, which is important. I’ve been using it for about a month and really trying to stress test it. I couldn’t find any flaws and believe me, I tried. For a keyboard coming in at $69.99 I was skeptical. It is quite a deal if you ask me. Not an entry level gamer or looking for something a little more advanced? Go check out my review for the Logitech G810 and see if that tickles your fancy. You can order your Logitech Prodigy G213 RGB Keyboard right now by heading over to Logitech. Big thanks to Logitech for hooking us up with the newest gaming peripherals. These tools aren’t going to test themselves, ya dig?